Will the Midterms Create a Mandate for Minimum Wage Hikes? Progressives should not think of this election as another Republican “shellacking,” but as the year some Americans got a raise. For the national Democratic Party, there are only two possible outcomes in today’s elections: bad and worse. Even in the best-case scenario, Democrats will barely hang onto a narrow Senate majority that is virtually powerless in the face of Republican obstruction. However, while the headlines tomorrow are likely to be grim, progressives can take heart in tangible policy victories in four states, all solid red in the last election, where voters are set to give the working poor a much-needed raise. 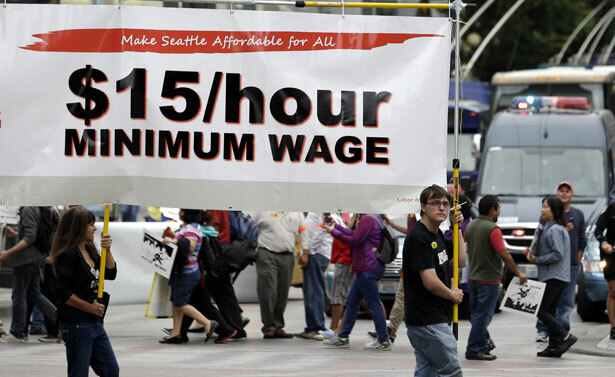 Perhaps no issue has been a bigger political winner this year than raising the minimum wage. Indeed, after Seattle raised its minimum wage to a record $15 an hour and fast-food workers nationwide united to demand higher pay, the undeniable resonance of this issue with mostly apathetic midterm voters demonstrates the power of social movements to transcend partisan politics and drive the electoral agenda. Furthermore, it is a clear signal that these elections, whatever their outcome, should not be thought of as a triumph of right-wing politics over progressive Democratic ideas. To the contrary, if Republicans prevail, it will be in spite of their support for right-wing policies.